The adorably detailed diaper bag resin Christmas ornament is an instant hit with parents who know a well-stocked bag is essential equipment anytime they leave the house! 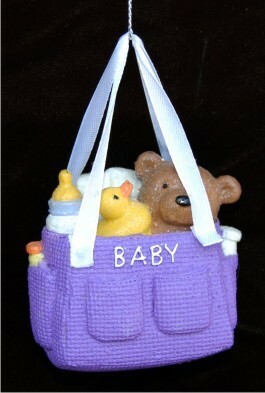 These baby ornaments will delight recipients when received in our custom velvet gift and storage bag. The purple resin diaper bag ornament is perfect as a baby's first Christmas or birthday, and many place it on top of a shower gift as a cute present topper.